Momma Told Me: Let's get crunchy. Growing up there was one thing I especially enjoyed about eating out; okay there may have been two. No, it wasn't the endless barrage of kid's meals with chintzy coloring pages. Besides, those 'activity placemats' usually came with just 2 crayons, and it was a minor miracle if they were two different colors, let alone anything that would work into the coloring design. But I digress. Aesthetic place mat issues aside, my family would often visit Chili's, back when the Awesome Blossom was, well, awesomely on the menu, and we didn't have to trek to the Outback for our fix of Whole Fried Onion and 'Bloomin' sauce. I've seen these onions go home before, half slumped over, and sad, in a Styrofoam container, likely never to be eaten again (because we all know fried food doesn't reheat quite the same). This never occurred in our small 3 person family, where my father and I would go head-to-eat, strand-for-strand in a fried onion eating contests of sorts. Yes, I despise onions in all other forms, but give me a properly fried piece of onion, slathered in creamy 'special sauce,' and I'm there like an ant at a picnic. You may recall that we are on Post #3, of our 5 part series featuring potato chips in cooking and baking. The first two recipes were a tad bit shocking for some, who I hope have now reconsidered the salty/sweet combo as a reasonable stretch. The simple fact is that both the PB+J Thumbprint Cookies, and Potato Chip Brownie recipe can in fact be made without the potato chips if desired (I designed them that way for those still being awoken to the fried potato possibilities). Today, there is no substitution on the chips, they are the proverbial, okay, actual, breading that holds this recipe together. However, a friend of mine pointed out on Facebook that some people have onion allergies, or a simple distaste for onions, and I humbly suggest you try this recipe with Zucchini slices, and perhaps a sprinkle of shaved Parmesan! That's right, today we are featuring Onion Rings made with a generous crumbled chip 'batter.' But these aren't just any onion rings. I recall the first time I attempted to make onion rings at home- it was a rousing un-sucess. 20 seconds after hitting the rolling oil all of the batter was floating North, with sad browned onions sinking to the bottom. It was an anti-climatic affair; but I picked up my knife and oil, and hit the books again. That's how I learned you can actually Oven-Fry your onion rings (and I suspect many other things). Of course, like anything else dealing with hot oil, it is important to be extremely careful when handling your baking pan, and to always use a utensil when turning frying food. And, naturally, this will present some of the usual issues 'frying' things do; such as the light smoke scent as the oil reaches temperature, and the cleanup of said oil. But, in all, this recipe uses considerably much less oil, and I reckon is far healthier than traditional frying. So I have you intrigued? I'll admit, my mind was blown at first, and I was indeed skeptical of a process that sounded like it might be best off left on Pinterest than in my oven. However, this simple recipe yields the most amazingly crispy, wonderfully flavorful, perfectly cooked slices of fried onion I've ever had. Not to mention, they look awfully gourmet, which is sure to garner plenty of compliments at your next cook out or game day celebration. This recipe also uses Low-Fat Plain yogurt, which drops the calorie count once again, over traditional cream based batters. Lastly, this recipe is perfect for even novice home chefs, and is virtually fool-proof, so long as you get your oil hot enough, in the oven, and turn once halfway through cooking (over-handling before the batter has set might result in sticking of flaking). 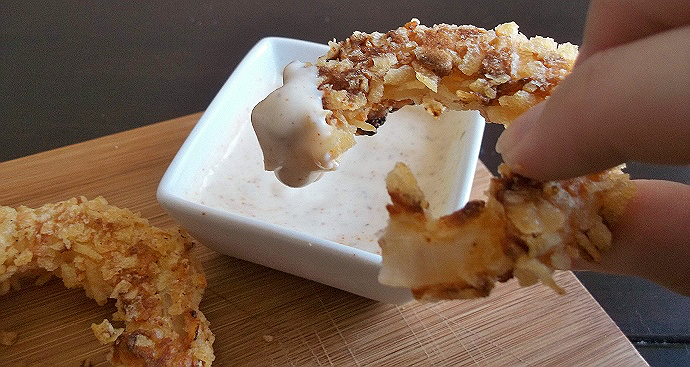 Oven Fried Potato Chip Onion Rings might sound odd at first, but it's no further a leap than potato chip (or corn flake) battered chicken. 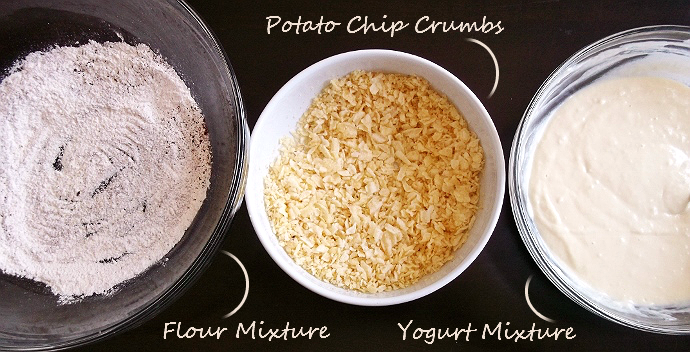 Cooking with potato chips, especially in recipes such as this, help find creative uses for those leftover crumbs from your Fourth of July gathering, and offer a great chance to get out some aggression pounding stray chips into crumbs (or you can do it the dull way and use a food processor). The recipe calls for some spices, such as Cayenne and Pepper, but I prefer to substitute Chipotle Powder, as I'm lucky enough to have a bottle of it on hand, which brings more flavor and less heat to the recipe. Make it however you like, just prepare for the compliments! If you're looking for an Awesome Blossom like experience, there are several recipes online to modify Ranch dressing. See our Double Chocolate Potato Chip Brownie recipe in our first series post. What Daughter Says: Put a twist on this fried appetizer classic with the addition of potato chips and an oven! 1.) In a large mixing bowl combine 1/4 C Flour, 1/2 TSP Salt, and 1/4 C Cayenne (or seasoning substitute, such as Chipotle Powder). 2.) 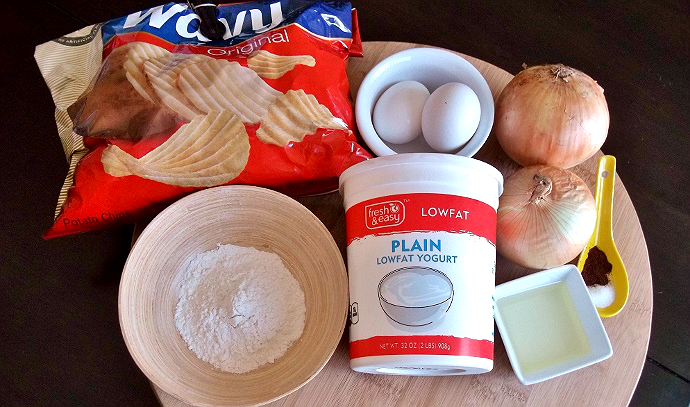 In a medium mixing bowl, combine the yogurt, eggs, and 1/2 C plus 2 TBSP Flour. Whisk until batter is smooth. 3.) 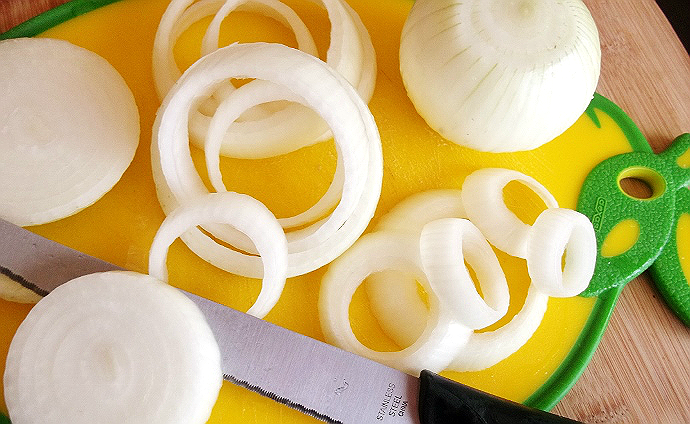 Peel the onions and slice them into 1/2" thick rings. 4.) Cover a baking sheet with parchment or foil and drizzle with the vegetable oil, then pre-heat it in the hot oven for 8MINS, or until oil begins to smoke. 5.) Toss the onion slices in the flour mixture. Dip each ring into the batter, and allow the batter to dribble the excess off. 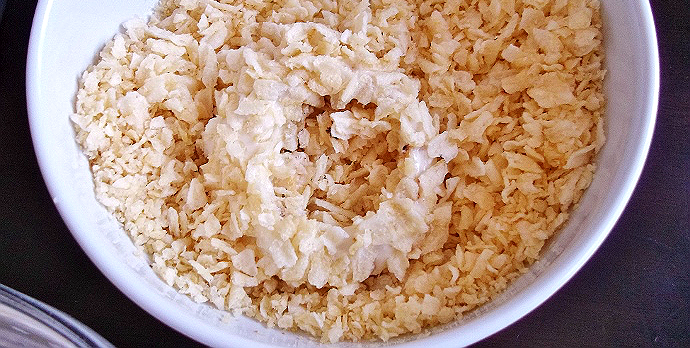 Next, dip the rings in the crumbled potato chips (the finer the better). 6.) Place the rings on the baking sheet and bake for 8MINS, then flip each ring, once, and bake an additional 8MINS. You will likely have more rings than will fit on one sheet, and have to bake in batches. Sprinkle with salt, while they are still hot, to add additional flavor. Seriously these look unbelievably good! I saw the picture on Instagram and I was drooling! I need to try this! Thanks! YUM! Seriously what a creative idea. I never would have thought to use chips. I never would have thought of oven frying them. And I'll bet the potato chips make them super crunchy. I can imagine one could go all manner of crazy with different flavors of chips and have onion ring smorgasbord! I adore onion rings, but I had a very scary experience with a big pot of oil years ago, and so I have not tried to make any. These look fantastic, and I am very excited to try this recipe. Thanks!!! I gotta say - these rings look a whole better than some I had recent at the restaurant - BRAVO! 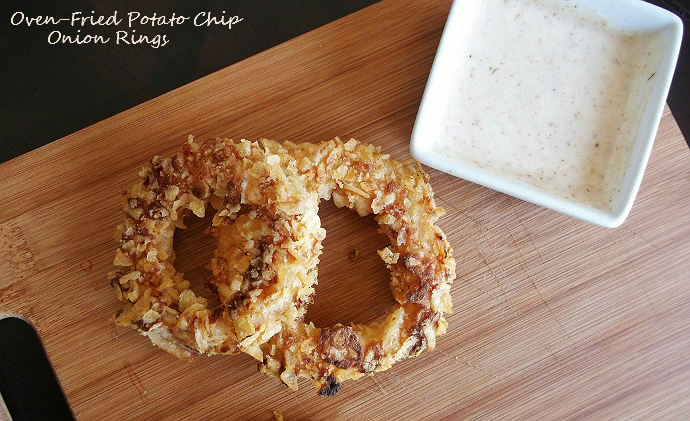 I never would've thought to use potato chips to crust onion rings. I am definitely going to have to try these out! Potato chips are a brilliant idea! They didn't get soggy overtime? I really love this recipe and am anxious to try it. OMG these look amazing! I don't have a deep fryer so Ive never made onion rings before - I'm excited to try these! 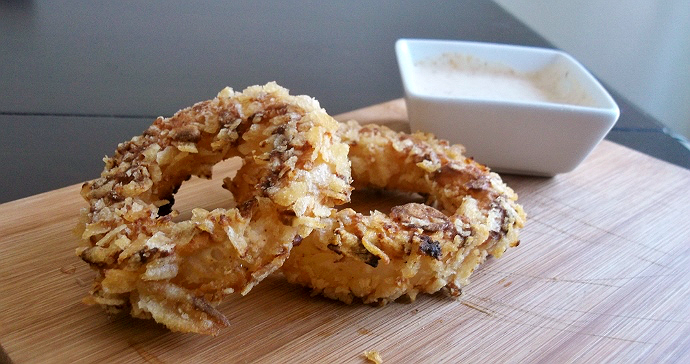 Love Onion rings, we'll have to try these! Homemade is always the right way to go! These look great.